Download from the App Catalog : Palm USA | Palm webOS Applications | Mobile apps that go further. * A twitter client Bad kittty – programmed to display your profile. * Web browser, which opens a predefined Website. * Foursquare, programmed to display your favourite venue. * Google Maps, programmed to show stations nearby. * Email app with filled information like mail adress. * All your favourite News apps. * Bug fix when adding new app. * Precentral Forums launch should work fine now. 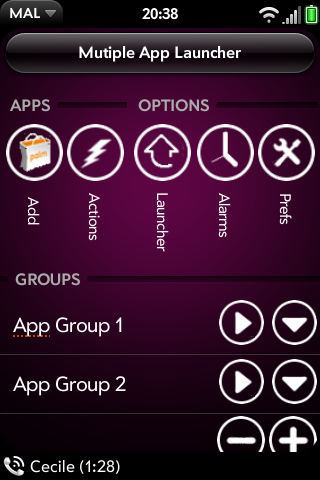 * Compact mode to see more groups on the screen. * New dashboard for alarms and palm launcher shortcuts. Last edited by boucles0; 04/18/2011 at 02:06 AM. cool thanks for that. Now when I figure out which ones I want to open up together, i'll check it out! I'm really glad that someone is already on top of this. Thanks! It'd be cool if you could create subsections within the app. So instead of one big list of apps you could have several different lists, each able to be launched into different stacks. Also if launcher icons could be made for each list that would be suuuuuuuper awesome. well, we have the same ideas, that's features I'm going to add ! Cool app. An idea, if possible you could choose to load all apps or just on or the other and place shortcuts it would be like Category folders on Android and iOS. nice. I'm going to see how to do that.... thanks for your comments. For some reason I'm not able to find this app in the beta feed.... was it removed, or am I just totally retarted? Palm USA | Palm webOS Applications | Mobile apps that go further. Multiple App Launcher lets you launch several apps at once. Add your apps to the list, and choose to launch all apps in a stack or seperate. Create app list with facebook, twitter client, games, whatever ! This app is available in beta version 0.1.0 : Palm USA | Palm webOS Applications | Mobile apps that go further. This is just a first rough version, many updates are coming ! Awesome, It's so nice to read something that brings a smile to my face. Found that one, but can't find it in Preware or App Scoop - don't those access all the apps in the beta feed? I'll put it in feeds when I'll be in front of my computer. 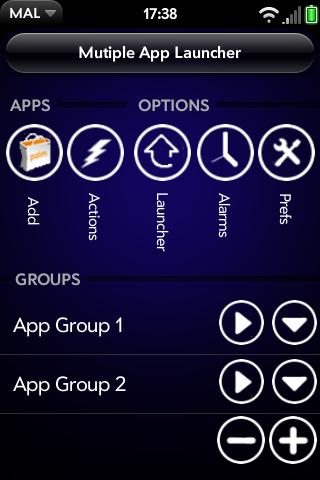 I have already plan to add palm apps, beta and web distribution feeds. It would be great if you could make the app load itself when the phone boots up and then automatically opens the apps you want. Also, it would be cool if you could somehow make the apps save state, so that when they are opened, you'd be where you left off.